British heavy metal band DIAMOND HEAD brought us many gems including Lightning To The Nations, Borrowed Time, and the jewel in the crown, Am I Evil? 2007 turned out to be a phenomenal year for Diamond Head, and especially a very exciting time for the fans as the tours with Tesla and Thin Lizzy seemed to pop up out of nowhere. How did these tours come about, and what have been the highlights of the last twelve months for you? We were in the right place at the right time, and of course able to say yes. You have to be on the radar to get gigs like this and we have been working hard for a number of years now to get to this posistion. 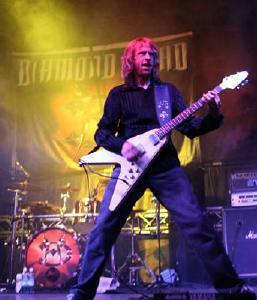 The highlight was the Thin Lizzy tour - it was a great opportunity for Diamond Head and we all enjoyed it. It has been Ab's [guitarist Andy Abberley's] ambition to play Hammersmith Apollo and we did that so that's one off the list! And how does this compare with 1982/83 for you? 1982 was my favourite year. Diamond Head seemed to be getting somewhere after six years of building. We had Borrowed Time out and in the charts, we did Reading Festival. It was a great time, so the comparison is that this is much harder - no record company support, no agency, no tour bus, no roadies... touring and getting gigs 2007 style is all about do it yourself. In February you're off to Japan. What are you most looking forward to about the trip? Seeing what it's like in Japan. I have never been there, and I'm looking forward to meeting some new people and spreading the word. The reviews of What's In Your Head (great artwork by the way!) have been very encouraging. How did that album come together? Nick and I started writing songs back in March 2005 and continued until we went into the studio September 2006. We had about thirteen days when we could use Dave 'Shirt' Nicholls as he was on tour with Stone Sour, and then we had November and December to finish writing the last few songs before Shirt came back at the end of January to record and mix the rest of the album. It took about 19 days to record and five days to mix, not including Karl's drums. He recorded the drums himself in San Francisco and sent them over on DVDs. What guitars and effects etc did you use to record the What's In Your Head album? I use my two Gibson Les Paul Standards, a PRS, and a Taylor acoustic. I used a Whammy pedal and some of the effects in the Pod Pro. Most of the sounds are a combination of different amps - ENGL, Marshall, Mesa Boogie & Pod. You've been playing This Planet And Me, Skin On Skin, I Feel No Pain, and Killing Me in your set. Why these four? We did rehearse all the songs from the album but these sounded the best. We also liked Victim and Pray For Me but the other four were the stongest. Any plans to include others from this album? We may add more as time goes on, but not yet as we still want to add some different old songs like Makin' Music and Sweet And Innocent. Diamond Head albums have always shown progression - Canterbury was a massive departure from Borrowed Time, your 1993 album Death & Progress was contemporary with the time, as are All Will Be Revealed and What's In Your Head - they all retain characteristic Diamond Head trademarks without sounding dated. How far are you influenced by current bands when you write? I try not to be influenced by current bands but little bits do creep into the writing process, and sometimes you need a point of reference when you're trying a new song out. It's a bit like... so that others can get a handle on it. It's interesting that I can take a snippet of an idea from another band and once the song is finished no one can spot where the original idea came from. How did you feel when you realised that the entire first vinyl pressing of Canterbury had a glitch in it? I dont know, that was 25 years ago. Depressed, I suppose. I know it didn't help us get into the charts... and I got sick of people telling me their copy of Canterbury jumped, like there was something I could do about it! When magazine reviews and articles are restricted to a set number of words and they use up so many of them talking about Sean Harris and the past, rather than the present or the future, how does that make you feel? Any publicity is good publicity so I don't mind. The main thing is that people have accepted Nick in the role as lead singer. Lots of bands have replaced their lead singer like Iron Maiden, AC/DC, Van Halen, Deep Purple, Genesis, Black Sabbath, Uriah Heep etc.Sometimes it has to be done. We can only do our best with what we have. The future is unwritten. And how about all the comparisons to Metallica/Megadeth eating into those fixed number of words? It's great to be associated with such huge bands and we have gained a lot of fans through them. Your debut album Lightning To The Nations was recently voted the 3rd best album for riffs in Burrrn! magazine just behind Sabbath's Master Of Reality and Slayer's Reign In Blood - and ahead of Iron Maiden, Deep Purple, Motorhead and Led Zeppelin. How do you feel about that and what sort of feedback have you had about it? Not much feedback yet, but obviously I am very flattered to be nominated amongst such wonderful albums. 3rd in the world is pretty cool for an album that was a do-it-yourself job with only 2000 pressings. Riffs 'R Us! Having toured with AC/DC, Megadeth etc, and more recently Thin Lizzy, which bands would you still like to go on tour with? AC/DC any day! 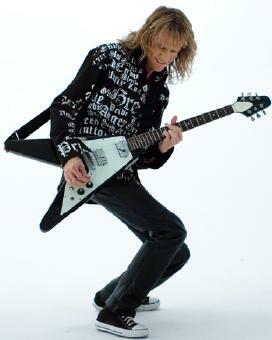 That was my favourite, and Megadeth was brilliant too - they were so nice to Diamond Head. As to touring in the future, I'm not fussy, I'll support anyone! Tell us some of your funniest Spinal Tap moments. We have had a few where we cannot find the stage from the dressing room. I remember once we played a gig up north in some cinema type place and there were loads of plant pots round the front of the stage so one of us said "You will have to move these" to which the theatre manager replied "It was good enough for Roy Castle"... And one time the intro tape came on while we were still getting ready and we all panicked and quickly pulled on our trousers and ran onstage and played an awful gig. We would sleep in the back of the van sometimes when we could not find a B+B, and after one cold night Duncan was stuck to the steel floor - his sweat had frozen him to the floor of the van! As with many bands who are experiencing a renaissance, this time around you've got Myspace, YouTube etc. How do you feel about the way some of the control is taken out of what turns up online, e.g. cellphone footage on YouTube before you've even got home from the gig? I don't mind. It's important not to do a bad gig though, because it will end up on YouTube. Hopefully people will get sick of the poor quality ones and the good stuff will remain. Without the Internet a lot of bands would struggle to get heard. It's been our fan club and contact point since 1999. Again, due to MySpace and the renewed interest in 'classic' rock bands, do you find that your audiences are including more Diamond Head virgins (that's fans who've never been to a DH gig before, of course!). If so, what's the reaction from them? Usually great! We have met a lot of first-timers, and any band needs that - we cannot rely just on the old faithful! I even met people on the Thin Lizzy tour who said to me "I have never heard of you before but you were brilliant!" So after thirty years there are still plenty of people who have never even heard of us, let alone seen us or bought the albums. It makes you think...! Outside of the music business, who are your heroes? Please suggest up to five heroes, living or dead, and tell us why. Richard Branson - because I admire his balls and the way he uses his energy to make things happen. Peter Sellers - for all the funny moments he has created on screen. Charlie Chaplin - again, for all the funny moments he has created on screen. My brother Dave - for getting me started on the guitar and never losing faith in me. Steven Spielberg - visionary director. 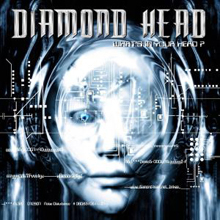 After the Japan trip, what else is coming up for Diamond Head in 2008? We are playing Dock'em 2008 festival in Holland and we have some more UK dates, and possibly Ireland. And finally... are you evil? Yes I'm afraid so. Keep rockin baby! Give it the berries!